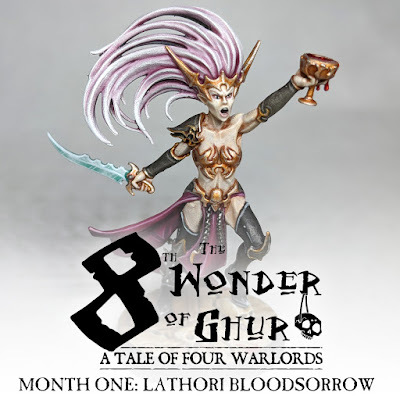 Last month I went over what The Eighth Wonder of Ghur: A Tale of Four Warlords was, but this month I'm going to dive a bit deeper into my role in it. 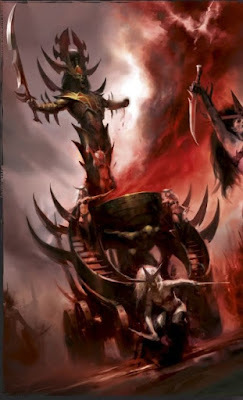 Specifically the temple of Khar Nair, my army of bloodthirsty Daughters of Khaine led by Hag Queen Lathori Bloodsorrow. So, why did I choose to go with the scions of Morathi? I have been tempted to do a Daughters of Khaine (DoK) project ever since I discovered the battletome was coming out. 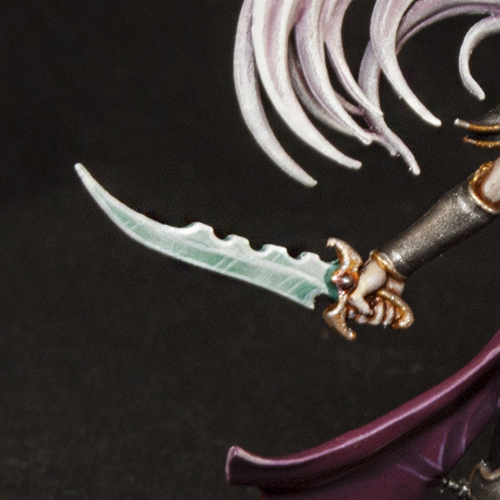 I remember when the 8th edition Dark Elves book came out for Fantasy and how cool the models were. I really loved the whole range and thought they did a stellar job at them, but something about the army just didn't grab me. When everything got split apart for Age of Sigmar I was instantly drawn to the DoK. They were the coolest parts of the Dark Elves off on their own (I also really like the Order Serpentis). I had painted one Witch Aelf up as a tutorial for the Warhammer Community site around a year ago, which was also a test model for me. I liked the scheme I came up with but got wrapped up in finishing off some Death stuff instead of getting a proper start on them. Fast forward to the release of the Daughters of Khaine book and I painted up one of the new Melusai to coincide with my review. This reinvigorated my interest in them yet again, yet with Legions of Nagash and Nighthaunt coming out either around the same time or shortly after I once again found myself painting up Death models instead. When I started talking to Eric, Mitzy, and Jimbo about the Tale of Four Warlords project I decided one thing. I definitely wasn't going to Death (okay, maybe I considered a Legions force for awhile). To be honest, I went through a couple of ideas before I decided on the DoK for good. At one point or another during planning I considered Legions of Nagash, Disciples of Tzeentch (both an Acolyte heavy and Tzaangor heavy version at different times), Stormcast, Kharadron, and Destruction of some sort. Each time I kept coming back to my small selection of painted DoK models though and eventually I couldn't resist the siren call of Morathi any longer. The first month's challenge was to paint up our general for our army. Knowing that a Hag Queen is a staple in any respectable DoK army, and also a classic archetype of the army's design ethos, I went with Lathori Bloodsorrow. I also have a tournament I am still painting Nighthaunt for, so I wanted to go with something smaller. She may get an upgrade a little later one with a Cauldron or I may hold off on that until I expand the army above 1,000 points, I haven't decided yet. 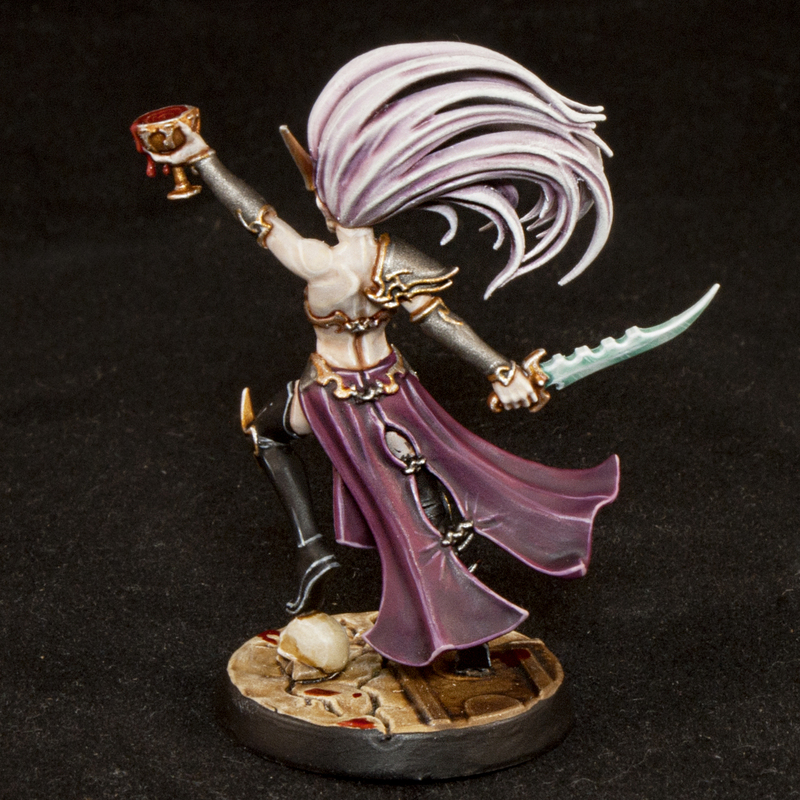 I painted her following the same tutorial I made for my first Witch Aelf, but with a few adjustments I originally tested out on the melusai. The hair is noticeably different, with a more classic Witch Aelf look to it, and I also used a brighter gold. On some of my more elite units and heroes I plan on painting their weapons as crystal, so I decided to do that on her knife as well. Originally I was thinking about painting her goblet as crystal as well, with the blood showing through it, but decided to go with a simpler gold look instead. I really like how she came out and she's got me pumped now to paint more of the DoK. The splashes of different color on them is a really nice break from all of the ghosties I've been painting. I'll still need to paint up some more of the Nighthaunt for Adepticon as well, so I think it'll be a nice pace switching back and forth between the armies in the coming months. Also, who doesn't love using the Blood for the Blood God paint? It's so much fun! This Tale of Four Warlords isn't just a painting challenge though, it's a narrative event and challenge as well. With that in mind I thought now was the perfect time to explore the temple of Khar Nair and Lathori Bloodsorrow a bit more! 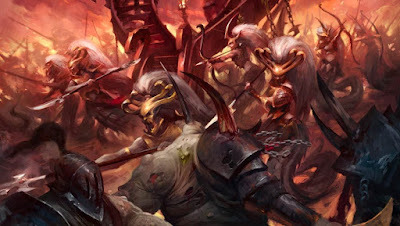 While some of the temple cities of Khaine can trace their lineage back to the Age of Myth and the dawn of their civilization, this is not the case of young Khar Nair. Founded during the tumultuous Age of Chaos, the temple was established deep within the confines of the bestial realm of Ghur. Rising from amongst the harsh landscape, it sits nestled between the raging seas and soaring mountains in the Shadowed Vale. Shrouded in the cloying mists commonly found around any of the Khainites' cities, it would be a cunning foe indeed who could approach the temple undetected. 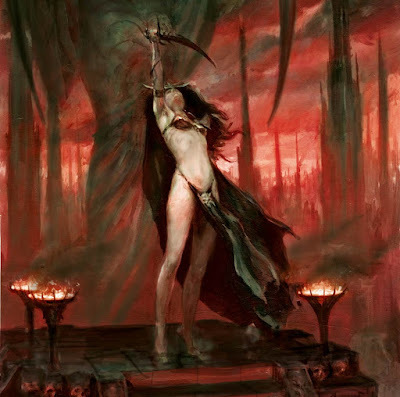 Though the location of the city may seem odd to those who are uninformed on the matter, it makes perfect sense to the Daughters of Khaine who first ventured into the realm in search of a shard of their broken god. Unsuccessful in their quest, the temple city was founded around a realmgate to Ulgu to more easily scour the lands and establish a stronger foothold within Ghur. Khar Nair quickly made a name for itself, easily fending off the frequent assaults of orruk hordes and roving Chaos warbands. Once the Age of Sigmar dawned and the city of Excelsis was established along the Coast of Tusks, the aelves of Khar Nair formed an uneasy alliance with the God-King's forces. The lithe killers are a frequent sight within the fighting pits of the city, putting on shows of deadly skill for the local inhabitants. This has earned them a wary respect from the armies of Excelsis and those who frequent the city on a regular basis. In fact, it's not uncommon to see the crazed killers of the temple marching to war alongside sigmarite clad Stormcast, or fortune seeking Kharadron, if the alliance suits their needs that is. 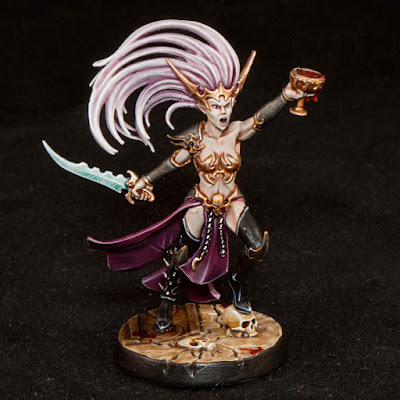 Though the public face of Khar Nair is that of the Witch Aelves and Sisters of Slaughter, the temple houses darker secrets, ones known only to those of Morathi's lineage. 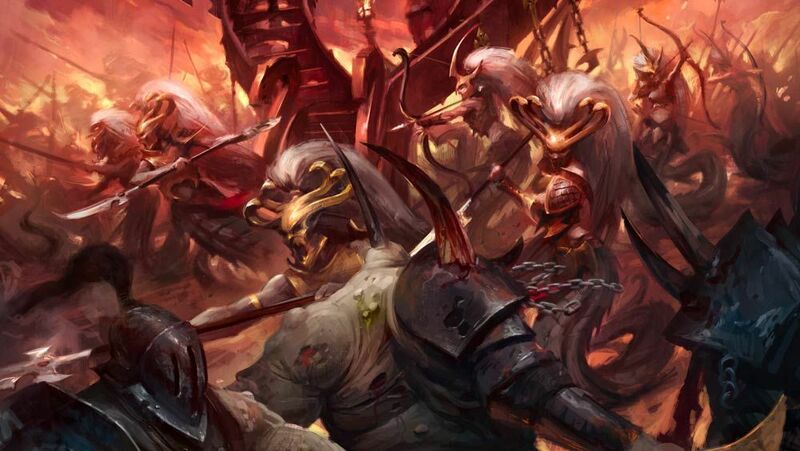 The dreaded melusai and khinerai make up a substantial amount of the temple's patronage, more so than is typically found amongst the temple cities of the Daughters of Khaine. Why this is so, no one is sure outside of perhaps Morathi herself. All that is known is that the Scáthborn keep a particularly close eye on their sisters whenever a whisper about their shattered god reaches the temple walls. Now it's time to get started on my goal for October; 10 Witch Aelves to form the core of my army. Be sure to follow the other members of this Tale of Four Warlords too, Eric at The Mortal Realms Podcast, and Mitzy and Jimbo on the Mitzy and Jimbo Show!